3DRetro will host a release party/signing of the Dinokitties: Kitty Rex (9.5") vinyl figure by artist Mab Graves this Saturday (4.27) from Noon to 3 PM at their Glendale location. First released in an incredibly small pre-release quantity at last year's DesignerCon, Kitty Rex is a striking translation of the artist's paintings of the mysterious, prehistoric hybrid. The mesmerizing inset blue eyes add a startling presence to the organic sculpture, while the sculpted-in scales offer a tactile experience which encourages you to pick up the piece rather than just admiring it on a shelf. Limited to 200 pieces, Kitty Rex will be available for just $80 at the event with remaining stock available after the event at 4 PM on 3Dretro.com. Painter Amy Sol will be at Woot Bear on Saturday (4.27) from 6 to 9 PM for the official debut of the newest edition of her Changeling Leaf art toy produced by Munky King. 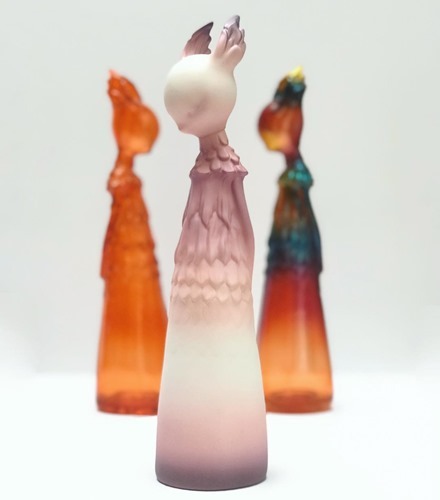 Limited to 100 pieces, the third edition (10.5", $70) of her new soft vinyl figures—based on her handmade Changeling resin sculptures—features a delicate, repeating pale pink to white gradient that echoes the theme of flora and fauna being two intertwined facets of nature. As a bonus, Woot Bear will include a free tote with all Changeling Leaf purchases at the event. In addition to the toy release, Amy will also be offering drawings, hand-painted Changelings and "select sculpts". If you can't make it up to SF for the event, Munky King will be releasing the latest Changeling Leaf figure from their web store after the event at an as-yet unspecified day and time. 3DRetro is set to release a brand-new Ahwroo from Gary Baseman. Limited to just 150 pieces, the new gray + pink edition drops on Wednesday (4.24) at $70 each, first with an in-store release at 11 AM and then a online release at 3DRetro.com at 12 PDT. Following the previously postponed black+red release, the new gray Ahwroo is the first new edition of Baseman's voracious wolf character in some time. Apportfolio unveiled its new Peanuts collection of art toys done in conjunction with the Peanuts Global Artist Collective at its Shanghai Toy Show booth. The inviting walk-in booth featured prototypes of upcoming figures from many of the collective artists including André Saraiva, FriendsWithYou and AVAF (Assume Vivid Astro Focus). André's pieces feature Snoopy, Woodstock and his signature Mr. A character—in yellow, as a nod to, and occasionally as Woodstock. The FriendsWithYou pieces feature Snoopy with their peaceful moon and cloud characters. 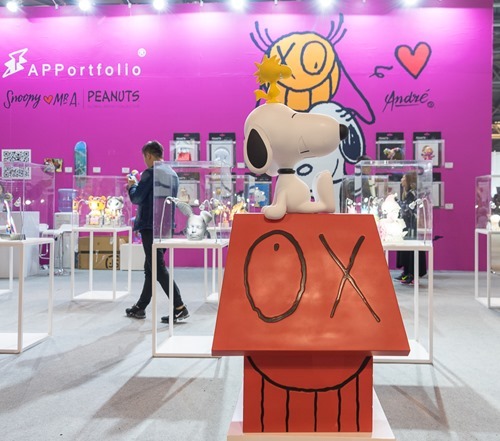 AVAF's Peanuts art comes to life with two neon-hued,crisscross renditions of Snoopy and Charlie Brown. Apportfolio was also showing what appeared to be a just-completed cosmic Charlie Brown by none other than Kenny Scharf. Many of the pieces are priced at 1480 RMB (~221) and are apparently scheduled for a Fall 2019 release. Definitely an exciting project to keep an eye on. Be sure to check the gallery for photos of each of the prototypes. Two plus decades since his debut on a Killdozer gig poster back in '92, Frank Kozik's Piggums is set to make another debut, this time time in soft vinyl from BlackBook Toy. 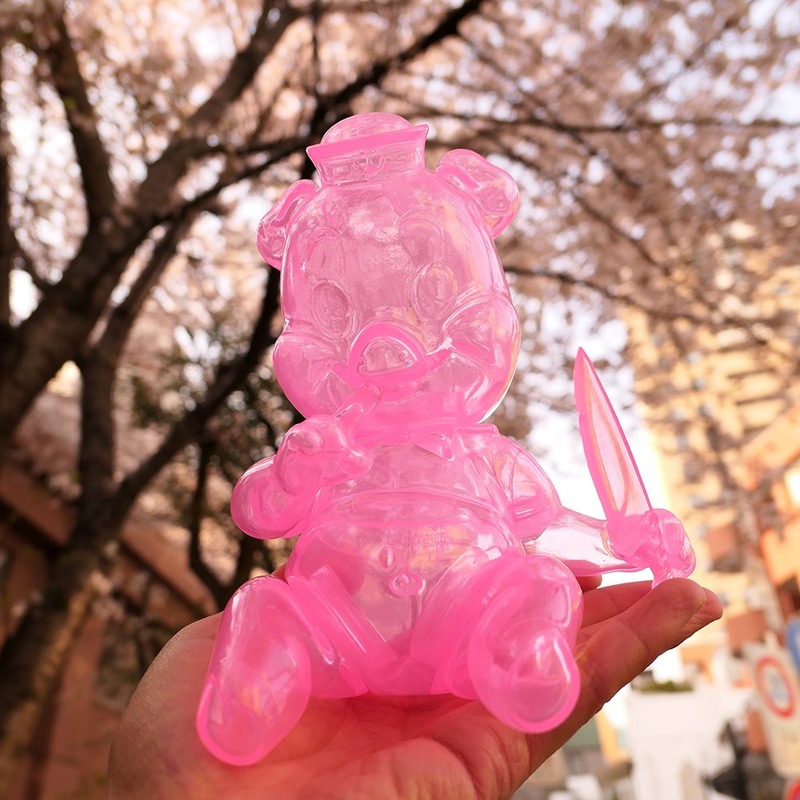 The debut Sakura Clear edition of the sailor pig figure stands 7.5" tall, features five points of articulation, and is cast in translucent pink sofubi evoking the color of Japanese's celebrated Cherry Blossoms (Sakura). Thanks to the clever articulation, Piggums can not only stand using the removable knife, but can also sit. 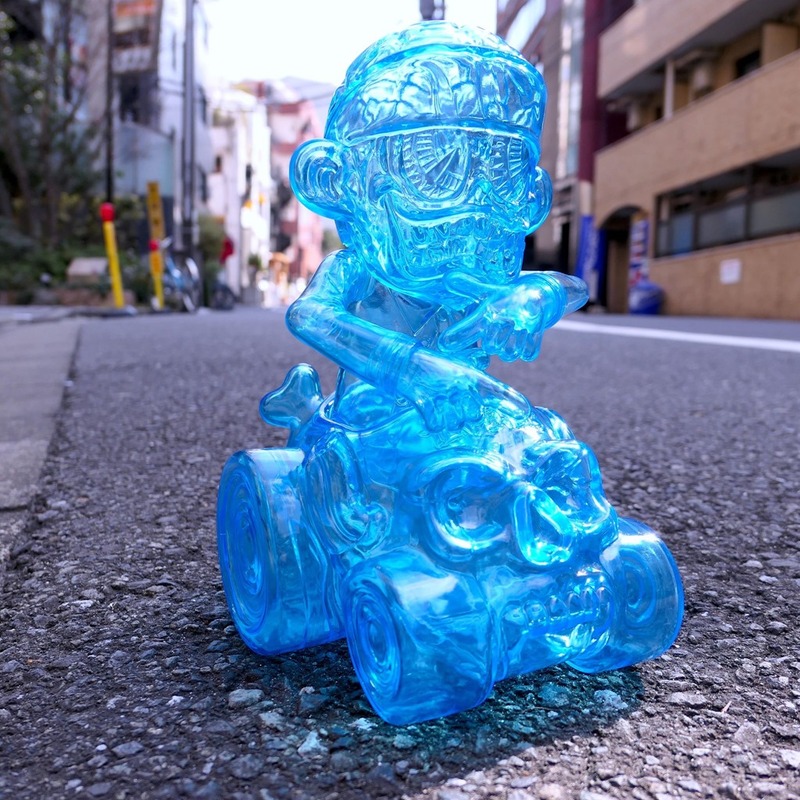 The Piggums Sakura Clear sofubi will be released on Saturday (4.20) at 8 AM PDT for ¥10,800 (~$97) from BlackBook toy. 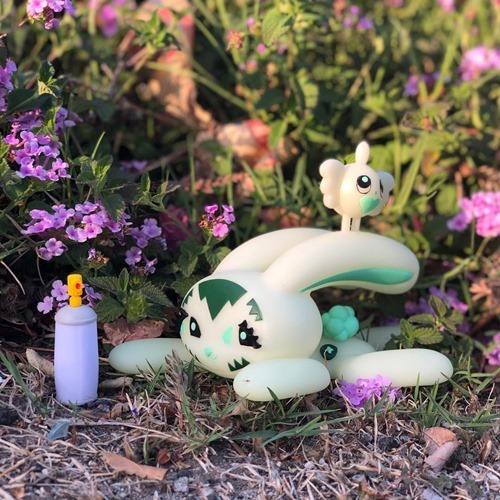 3DRetro will release its Exclusive GID Bunny Kitty vinyl from Persue this Saturday (4.20) from 3 to 7 PM with a special release event at its Glendale location. Limited to 100 pieces, the GID Bunny will be available for $50 and includes spray can and GID bird accessories. 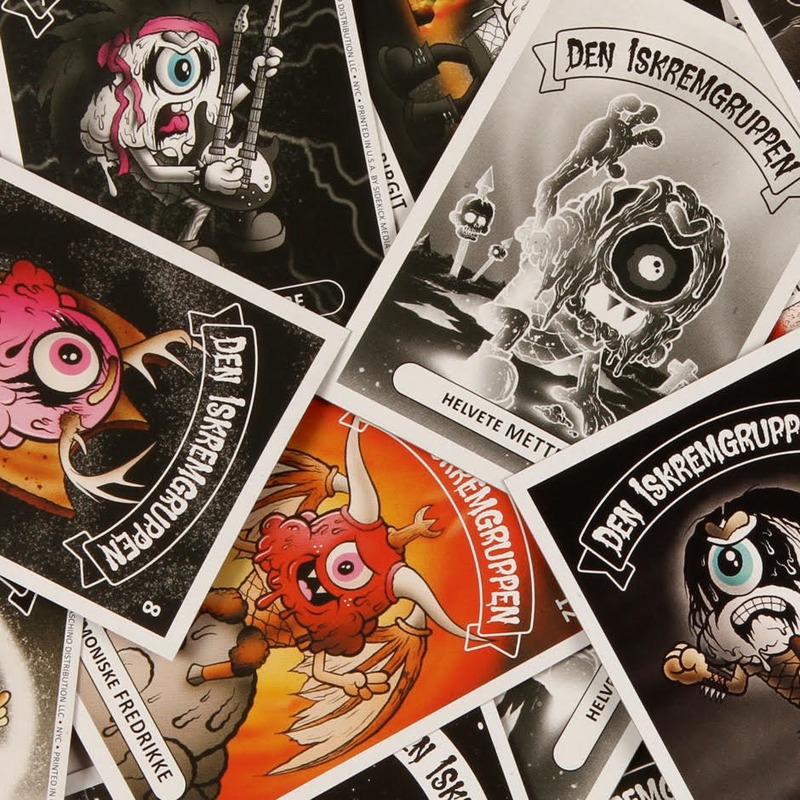 In addition to signing the toys, Dave Persue will be live painting a mural at the shop. Come for the toy and stay for the food trucks and 'dope' surprises. From the man who brought us the AD-AT and the Shuttle Max comes the long-awaited Superstar Destroyer. First shown as a prototype back at DesignerCon 2016, Bill McMullen's latest clever, cosmic kicks mash-up is about to become a reality. Limited to 400 pieces, the Superstar Destroyer seamlessly blend the iconic Shell Toe with the Empire's interstellar workhorse. The Destroyer measures 11.5 inches from front to back and stands 10 inches tall when displayed on the stand. While early on there was talk of using resin, this is vinyl throughout from the destroyer to the stand. Each Destroyer comes with an insert card signed (not numbered) by Bill McMullen. This is a must for McMullen fans and old-school art toy collectors. 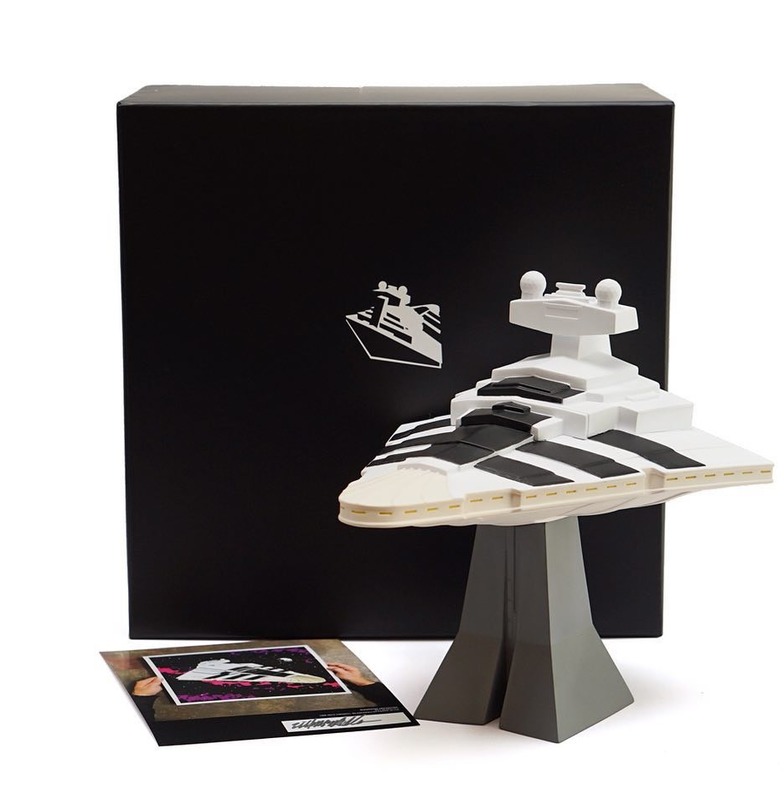 Superstar Destroyer drops on May the 4th (5.4) as a pre-order for $140 each from Munky King's online store and comes in a stylish, minimalist box. Expect these to ship at the end of May. 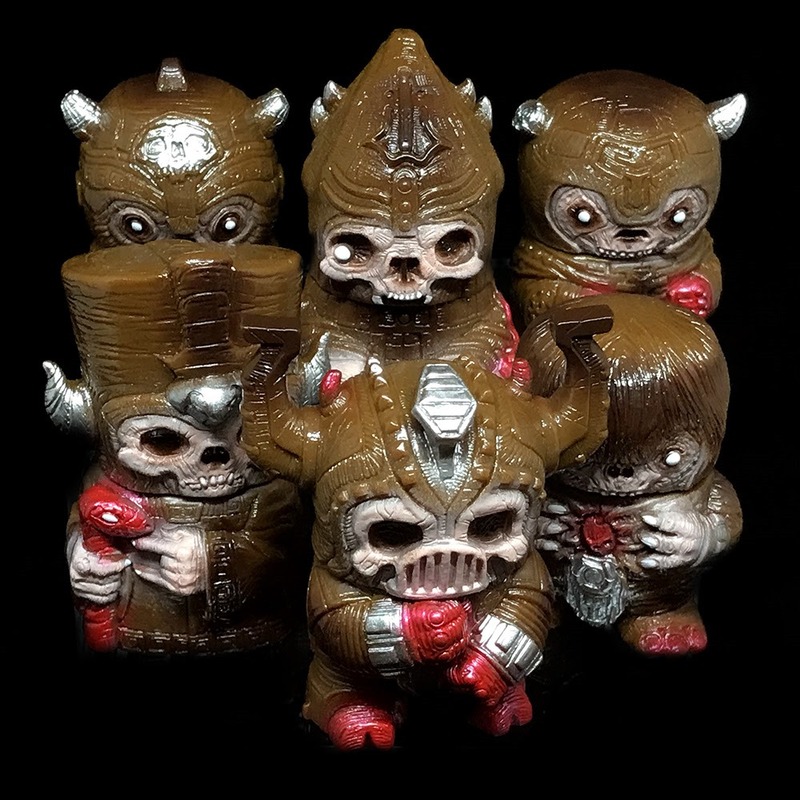 Toy Art Gallery continues its strong tradition of gacha-style soft vinyl sets with the debut edition of the new Nether Realm Tyrants from Radioactive Uppercut. Each of the six medieval-style minions—Cain, Beleaguer, Abel, Pyromancer, Plague Sacrifice and Mage of Set—stands 2 to 2.5" tall with battle-ready sculpts. The debut set features a gritty brown, silver and red color scheme, reminiscent of a deep, dark dungeon. The Nether Realm Tyrants are available now for $70/set over at the TAG Web Shop. Many of LA-based Johnny 'KMNDZ' Rodriguez's pop surrealist paintings celebrate birds, often depicted in and sometimes literally wearing the most unusual of bird houses—bombs, grenades, robot heads, farm houses and more. The curious and clever winged ones have adapted to their changing environments, shifting from the natural to the man made. As part of a special capsule collaboration with the House of Blues, Rodriguez created Hobs, a water tower bird inspired by the iconic structures which beckon music and food lovers to the restaurants for which he is named. The Hobs figure—skillfully produced by 3Dretro—is striking with its reality-bending concept with the weathered, old-fashion water tower enclosing all of the bird's head except for its long, curved beak. The sculpt makes strong use of its numerous individual parts to achieve the distinctive shape the concept demands. This approach is most notable in terms of the beak that extends far beyond the water tower in a fashion rarely seen in art toys. Other impressive details include the sculpted ends of feathers which jut just below the bottom edge of the water tower, further creating the sense that a bird lies within. Relative to Rodriguez's paintings which typically feature birds with spindly, delicate legs, the larger and thicker three-toed feet are the one conspicuous concession of artistry to the reality of gravity and the need for the stability they provide. Following its debut as a House of Blues Exclusive as part of the October 2018 capsule collection and a subsequent vibrant Red edition, the distinctive Hobs vinyl art toy returns today (4.8) in a Tenacious Toys exclusive GID edition. At first glance the new exclusive edition bears a strong resemblance to the OG House of Blues edition with little hint of being a glow in the dark toy. Wisely, the artist has chosen to take a subtle approach to glow by retaining the painterly, brush-like deco which gives Hobs a distinctive, organic appearance. 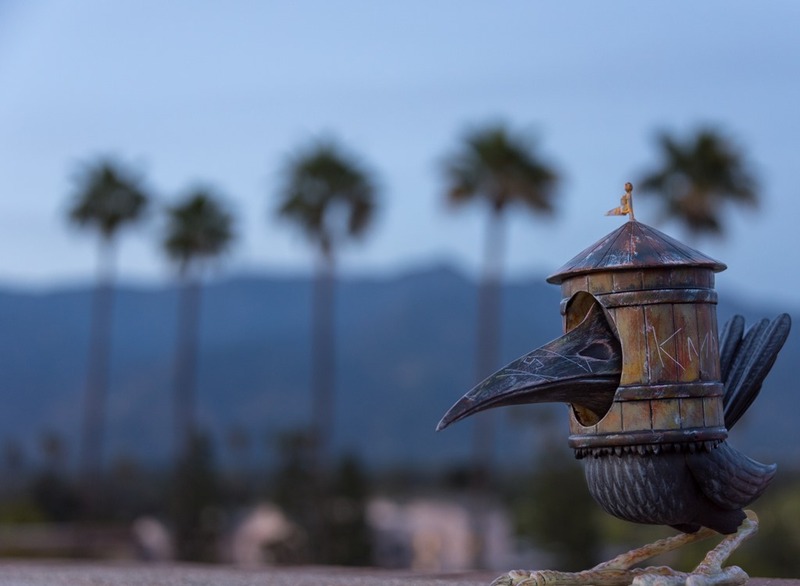 Starting with a hand-painted master sample from the artist, the factory has managed to recreate his overall original visual feel with colors blending seamlessly and naturally throughout the entire figure from the water tower to Hobs' elongated beak, tail feathers, body and feet. The result is a production vinyl toy that delivers on the promise of a three-dimensional painting/art object, remarkable given the complexity of the source material. With at least several hundred production vinyl figures in my personal collection, few deliver the sense of a hand-painted art piece as well as Hobs does with each edition from the Tenacious Toys exclusive to the OG edition. 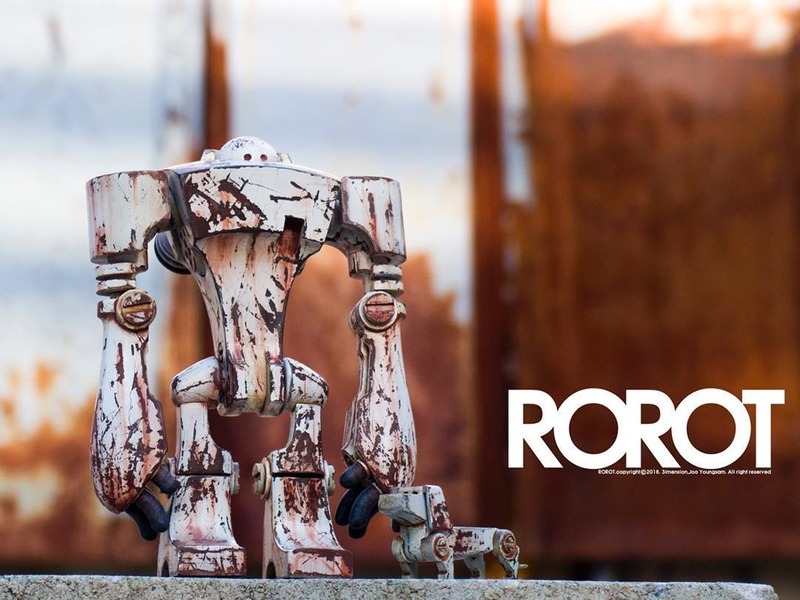 In lieu of the vibrant orange, reddish hues of the original edition, the Tenacious Toy exclusive offers a more neutral-hued approach with a stylishly pared-down treatment which allows the slight green of the GID vinyl used for the sides of the water tower and the feet to peek through and between the weathered-style paint. As suggested before, this choice prioritizes the figure's concept over maximizing the glow effect. While the GID exclusive has a definite glow, most pronounced in the feet, less so on the sides of the water tower, the effect is subtle relative to a pure GID figure. Think of it as an extremely well painted figure which offers 'stealth' GID features as an added wrinkle. From Johnny Rodriguez's imagination-provoking, pop-surrealist concept to the visually striking, ambitious sculpt and the organic, painterly deco, Hobs stands as one of the finest art toy releases of 2018/2019. 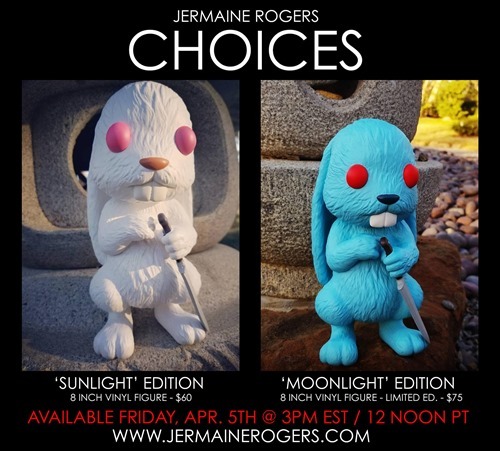 Limited to 75 pieces, Tenacious Toys will release their GID Exclusive Hobs vinyl by Johnny 'KMNDZ' Rodriguez and 3Dretro on Monday (4.8) at 9 AM PDT for $79.99 each from TenaciousToys.com. 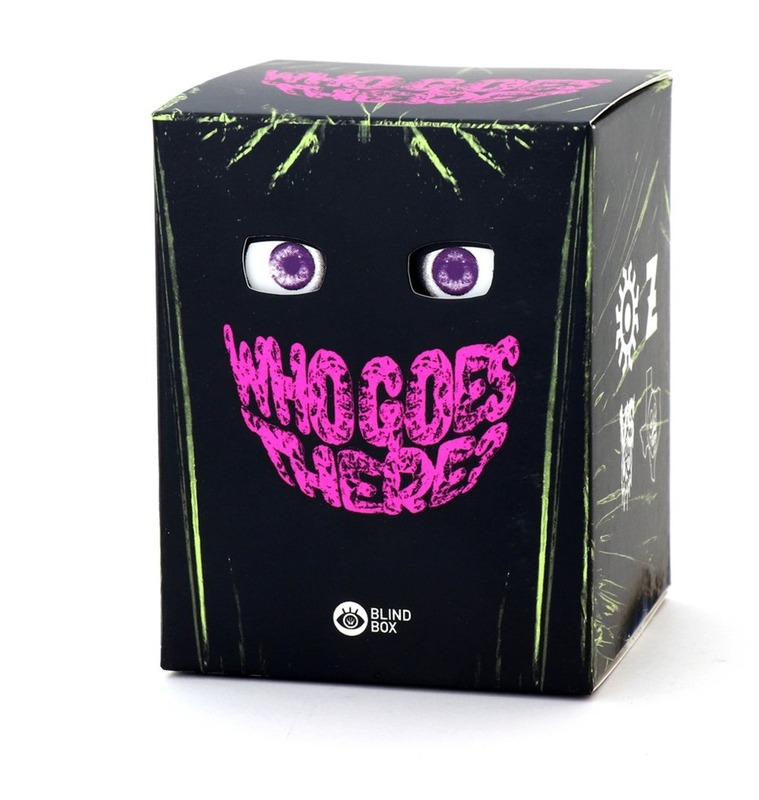 Unbox Industries is set to release the Who Goes There? blind-box series on Saturday (4.6) at 8 AM PDT for $13.50/blind-box or $156/case. Shrouded in a bit of darkness until recently, Unbox's second mini series turns the tables with a celebration of monsters and beasts from David Arshawsky, Retroband, The Last Zectron and Vilesore. From the clever packaging which features purple eyes peering out from behind a pair of cut-outs to the original gritty, keep-the-lights-on, marbled designs, Who Goes There? refreshingly flies in the face of today's trend of cute, cute and cuter. For those that enjoy their toys with a snarl rather than a smile, WGT delivers wicked, corrupted, evil fun in a box. 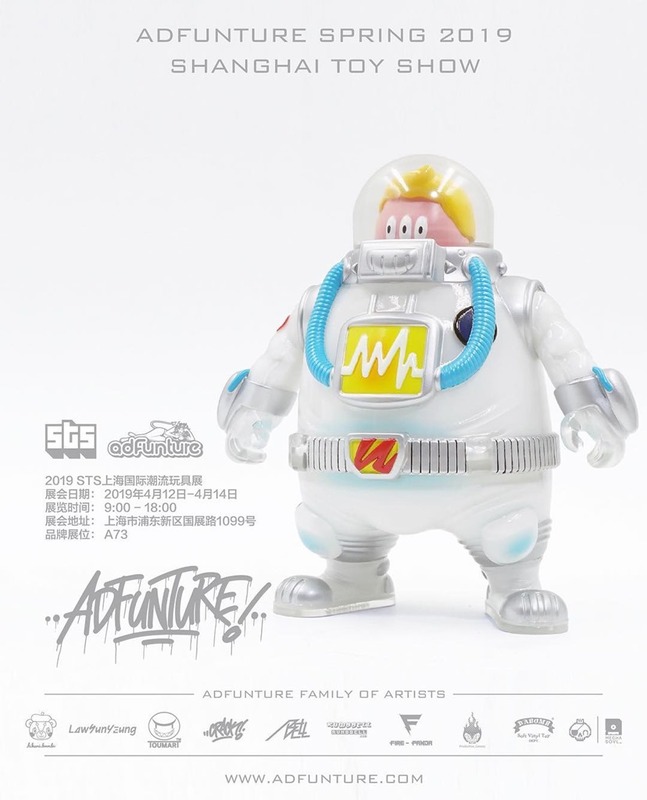 adFunture will return to the second-annual Shanghai Toy Show (4.12 - 4.14) with several new editions of their toys as well as special runs from guest artists. After the unpainted blue/GID debut and several hand-painted micro runs, Space Woody by Law Sun-Yeung is set to step out with the first fully-painted edition. Limited to 50 pieces, the new edition features a white suit design created on clear-cast soft vinyl. It will be available at STS (A73) as well as online from adFunture.com. After months of eye-catching photos, Korean artist Yama is set to debut his new Buddeng project at Shanghai Toy Show with pre-orders available (B82). Happiness comes in many forms including streetwear bliss. The apparent deity of hypebeasts the world over, Buddeng contemplates material existence decked out in Jordan 1 Off Whites, red kangol style hat and black-rimmed glasses. He's surrounded by a supreme calling from the golden Air More Uptempo to the unmistakable red+white luggage. In addition to the OG red edition, Yama has also shown a striking Stone Gold edition with a statue/idol vibe. Starting with a fun, stylish idea, Yama has achieved the full potential of the concept by delivering precise detail throughout. From the sneaker silhouettes (down to the treads) to the Rimowa-style suitcase which opens and features rolling wheels, Buddeng represents the culture in impeccable fashion. The pristine execution of the hypebeast essentials elevates the figure from commentary to coveted. The April Fools collection picks up the pace with the fourth and latest announcement from Fools Paradise. I Just Felt Like Running continues the adventures of Mario meets Forest and follows the previously released Super Run. Fools Gum's first stop is Shanghai Toy Show with a special pre-order offer with a special STS-only gift. 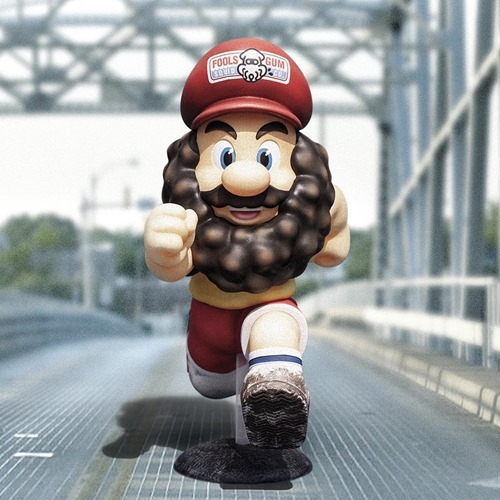 As with the other April Fools releases, I just Felt Like Running will be available for online pre-order on April 12th directly from Fools Paradise. Luxury comes in many forms including sofubi. Tomenosuke will release the third edition of the new Thomas Nosuke figure from Doktor A on Saturday (4.6) at 7:59 AM PDT from both their international and Japan-only online stores. 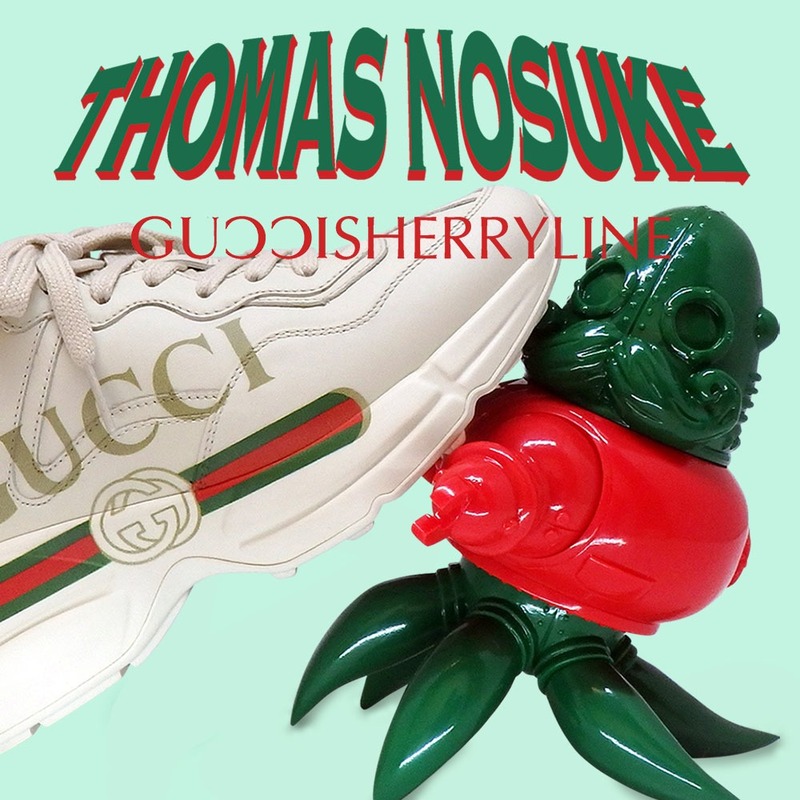 Guccisherryline features the classic green + red of the esteemed luxury fashion house and is the first multi-color edition, following Tiffanyblue and Hermesorange. As with the previous fashion-inspired editions, Guccisherryline is limited to 40 pieces, with 30 available online. As part of it's April Fools collection, Fools Paradise has announced its new XL Three King: Two Three // White edition. 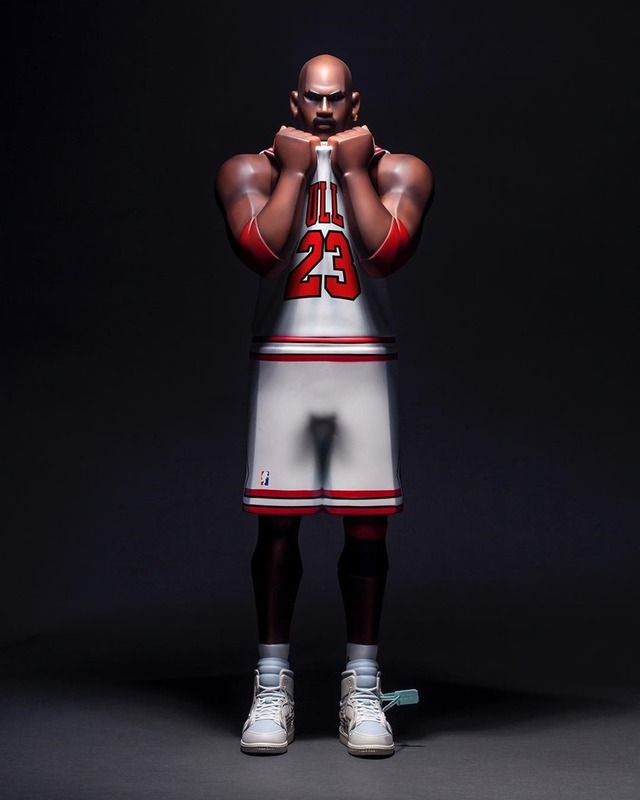 The large-format figure (!9.7") features a stylized version of his airness complete with highly detailed Jordans (white + baby blue). The follow-up to the sold-out OG XL Three King: Two Three //Red debuts at Shanghai Toy Show (4.12 - 4.14) with 100 pieces available. Online preorders will start on 4.12 from the Fools Paradise shop. After numerous rigorous R&D cycles, the technical marvel that is Labbiter XK-5 is ready to begin its mission to save Earth. 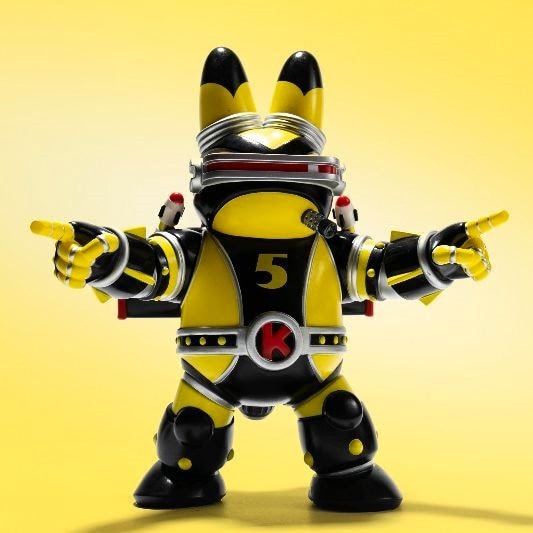 Evoking retro giant robots, Frank Kozik's half Labbit/half Robot warrior features an upright design with twin missiles, flight capabilities, and in a possible first for a KR figure— four (!) sets of interchangeable hands. The 8" Labbiter XK-5 debuts with the yellow + black Wasp edition, dropping this Friday (4.5) at select retailers and Kidrobot.com (9 AM PDT) for $100. KR will also have a Kidrobot.com exclusive which 'may or may not' be the chrome version they recently teased. There are several other editions coming including the silver+red edition set to launch at Shanghai Toy Show (4.12 - 4.14) via the Polyphony booth [B51]. 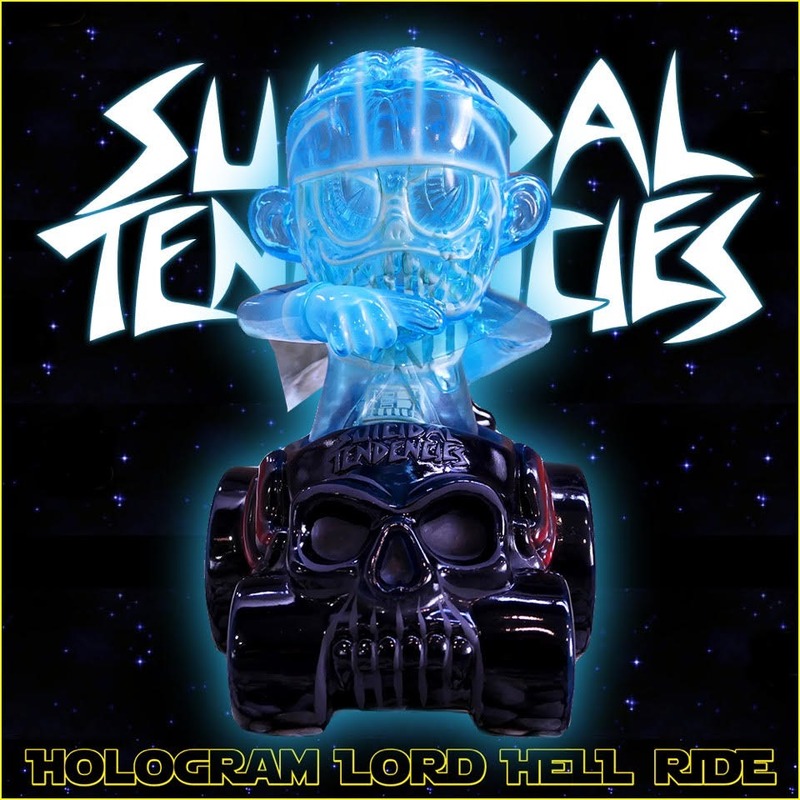 BlackBook Toy is following up the Hologram Hell Ride with the fun micro-run Hologram Lord Hell Ride. 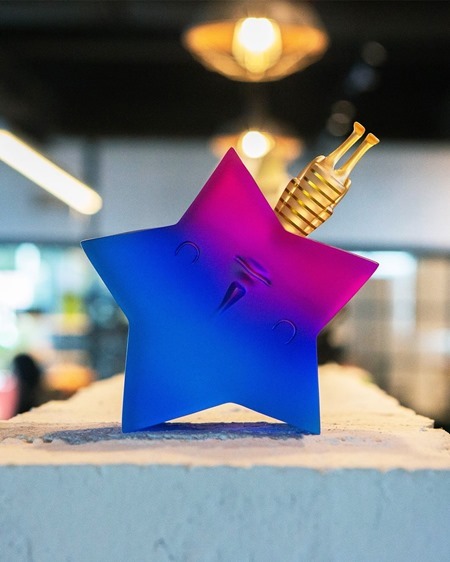 If you were wondering what the inspiration for the recent run of hologram editions is, this special edition of the brand's newest collaboration with Suicidal Tendencies holds the answer. Starting with the clear blue/hologram Hell Ride and Skum-kun, BBT has converted the wicked ride into one fit for a Sith by painting the inside black and adding red accents. This technique allows the original blue vinyl color to show through at the front grill and the large rear wheels. Skum-kun joins the dark side courtesy of a clever paint application using white spray to form the outlines of you-know-who's iconic suit as well as a clear blue cape and bonus mini light saber (random color) which can be affixed with 'soft glue'. Limited to just 5 pieces, Hologram Lord Hell Ride will be available for ¥17,000 yen ($153) via email-lottery from April 4th at 8 AM PDT to April 7th at 7:59 AM PDT. To enter, please see BBT's announcement and lottery information. The dream duo of HK artists Pucky and Chino Lam have blended their styles to create Fat Fish Fairy, set for pre-order at the upcoming Shanghai Toy Show (4.12 - 4.14). Pucky's magical fairy takes to the seas with a vibrant, light-hearted aquatic outfit with fish hood--a fun way to incorporate Lam's ocean characters--a sea foam dress with golden shells, starfish and more, flip-flop style sandals. and a metallic trident. Limited to 280 pieces, the Fat Fish Fairy will be available for pre-order for 759 RMB ($113) with 140 pieces on Friday (4.12) from the Pucky booth (A35) and the remaining 140 on Saturday (4.13) from the Chino Lam booth (B30). The figure is slated to ship at the end of May.